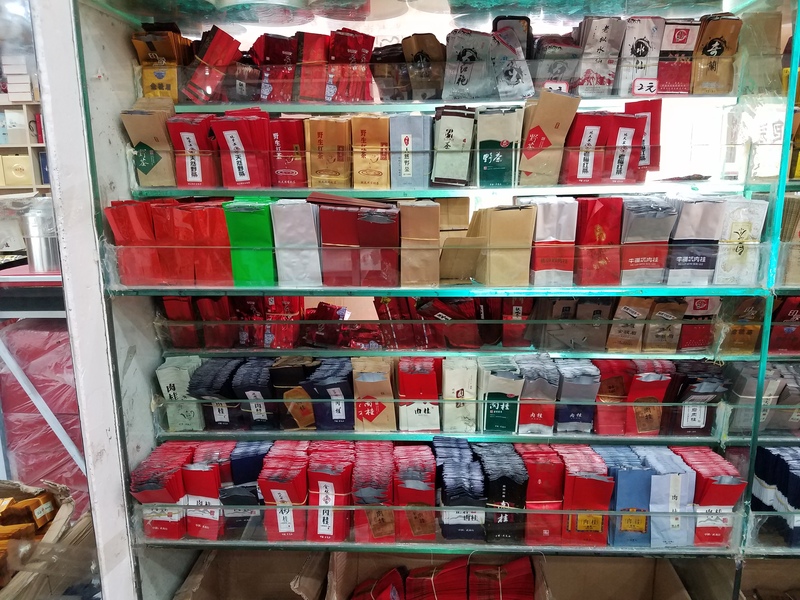 At the retail level most tea in China gets packaged into 5 to 10 gram packages. There are two standard sizes, a small one that can hold five grams of most black teas, and a larger size that is suitable for eight grams of twist oolong tea. When a tea shop needs to get packaging for their tea they will go to a specialty tea packaging store. These stores also have their own specialty. Some focus on ready to go offerings while others focus on custom packaging. Custom bag printers require large orders and setup charges for each design you wish to print. 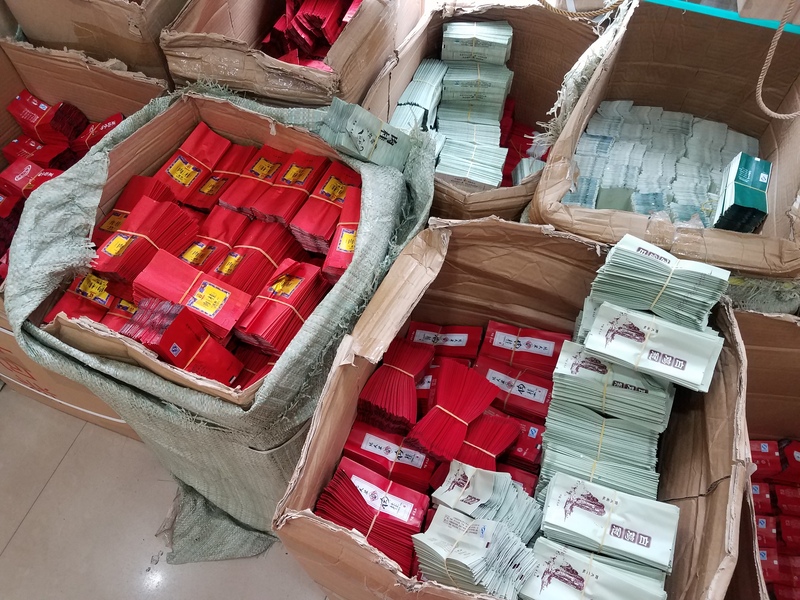 One way to save cost is to design a bag with just your logo and some fairly basic text like "Da Hong Pao" or "Wuyi Rock Tea" and ask the shop to do a mix of colors for you to differentiate your teas. 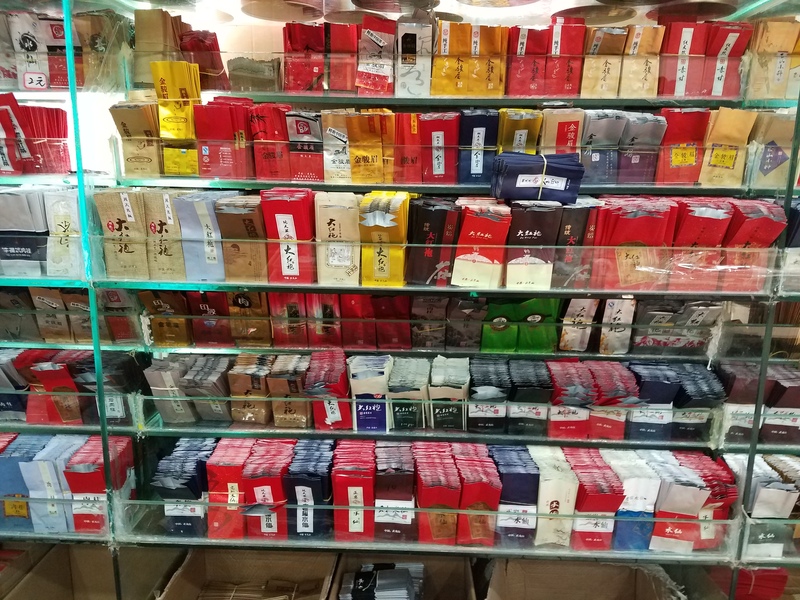 Since ordering custom packaging requires a sizable upfront investment and ongoing storage many shops don't bother with it. Shops with custom packaging are seeking to create a brand and generally focus on high end appeal with equally high end prices. 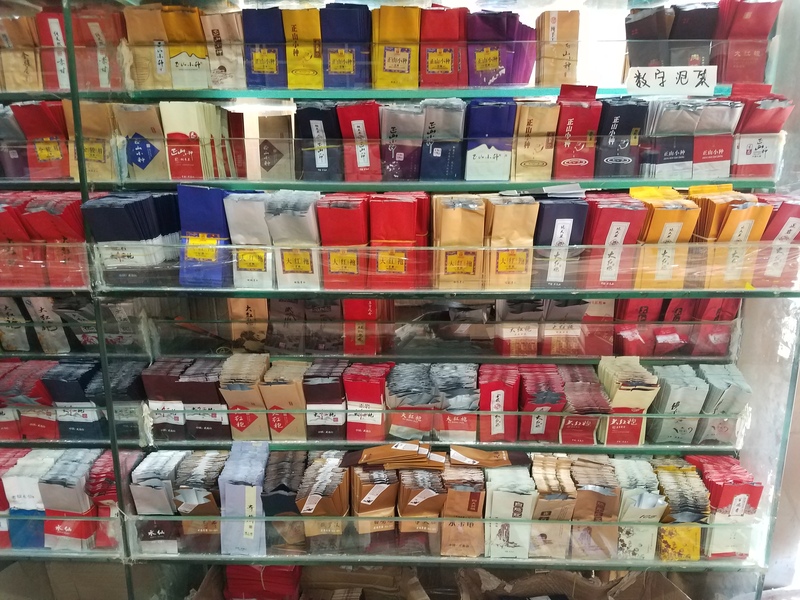 Da Hong Pao package selection in one store. Generic tea packages come in bundles of 100 bags. 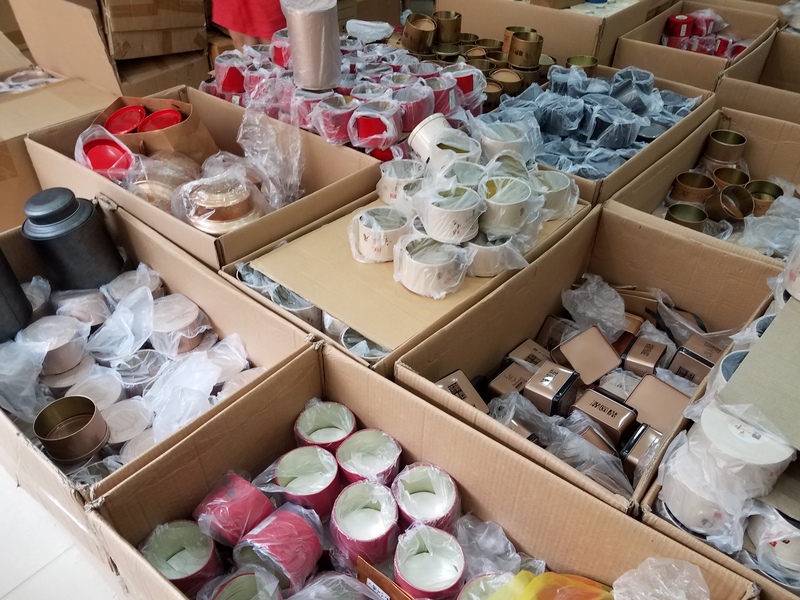 The packaging shop will carry various designs to choose from. Each design will have some different text options, but generally not all of them. Almost all the designs for large bags can be had with "Da Hong Pao" as the name of the tea, since it is can be used for all Wuyi oolong teas. Similarly, the small bags almost always have an option for "Zheng Shan Xiao Zhong". Zheng Shan Xiao Zhong bags at the same store. In addition to the bags for the tea cans and boxes are also available. These are sized to work well with the standard sale sizes. The common unit of measure in China is the jin (斤) which is equal to 500g. People will often order 1/2 jin of a particular tea. This corresponds to 250g, which when packed in roughly 8g bags equals 31 bags (31 bags x 8g/bag = 248g of tea). Many boxes are designed around common order sizes to present the tea in the best possible way. 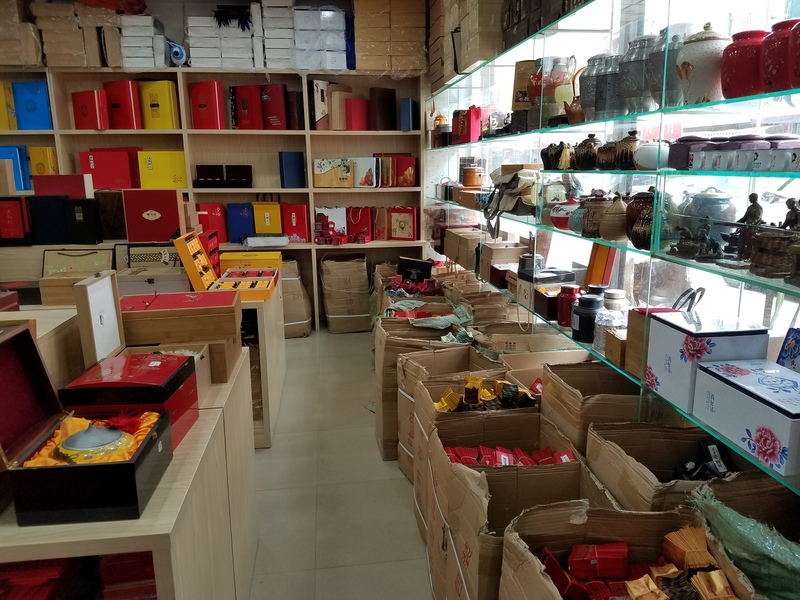 More Da Hong Pao and Shui Xian bags. Gift boxes on the left, gift urns on the right, with bags below. Tins, either used directly or as a package for smaller bags.